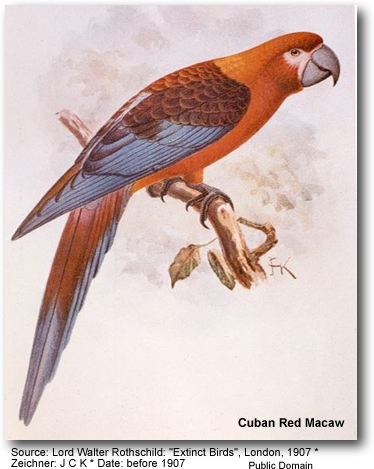 The Cuban Red Macaw, Ara tricolor, is an extinct parrot that formerly occurred on Cuba and the Isla de la Juventud. Its extinction was caused by deforestation, hunting for food and for the pet trade. It was reasonably common around 1800. A pair was kept in the royal menagerie of Schönbrunn Castle, Vienna, from 1760. It was a rather small species of Ara macaw, measuring 45 - 50 cm.